M48 Ops Combat Machete | BUDK.com - Knives & Swords At The Lowest Prices! $5 Friday Sale + $5 Shipping! $5 Friday Sale + $5 Shipping! PROMO CODE: BKFIVE258Shop All! 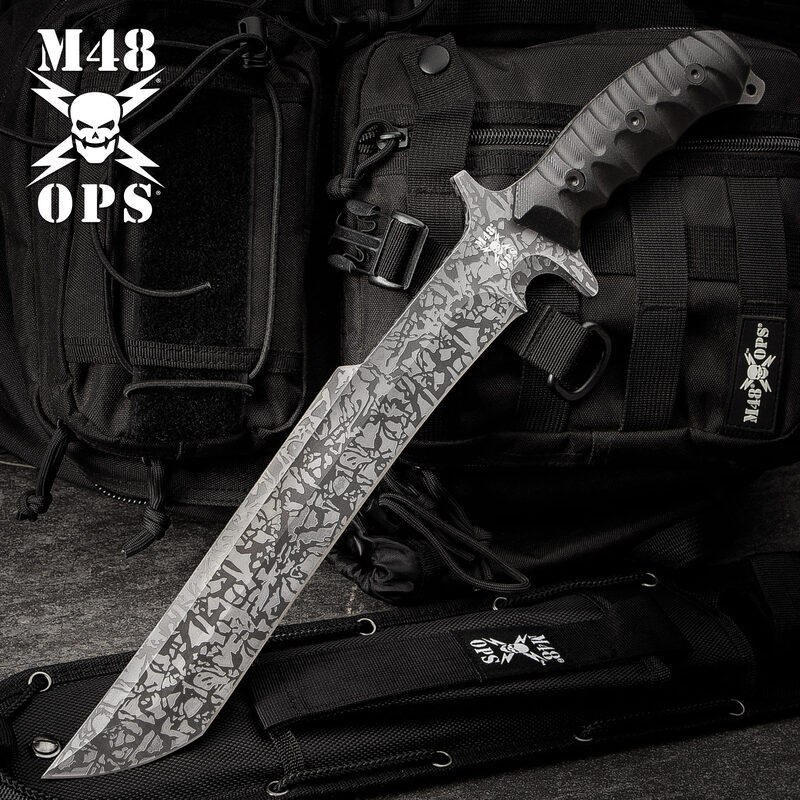 United Cutlery's new M48 Ops Combat Machete will have you covered no matter what special operation or dangerous mission you are facing. From the powerful, full-tang blade design to the military-style, reinforced M.O.L.L.E. 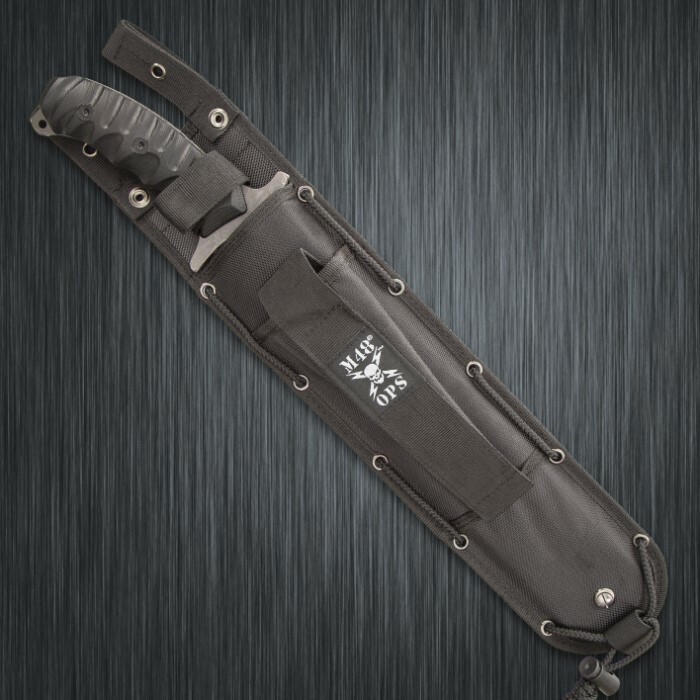 sheath, each M48 Ops Combat Machete is built to rigorous specifications for years of durable use and applications. Attach a lanyard to the exposed tang and put this bad boy to work! I struggled with buying this knife for a while simply because I didn't thing stainless steel was worth 90 dollars. But I eventually bought it and saw how thick it was and realized they put some work into it. I like the shape and feel of it and realized it would work great as a weapon and in a survival situation were I needed to chop small trees. Over all I know think it is worth the money. Best machete I've ever owned! This thing is a beast. I've only had for a few days and I'm very impresses with the quality of the blade and sheath. I have split and chopped wood with it with ease without sharpening it. I'm very, very impressed with it and will continue buying from budk. Truly amazing! Excellent knife, I do have to say I have no problem with the so called "sharpened finger groove". It's a "combat" machete, it's not a finger groove if it's sharp, it's for cutting rope and things like that. Everything about this blade is impeccable. Strong, heavy, detailed and functional not to mention gorgeous. From the Titanium etched finish to the G10 handle. Everything about this knife was done with pure class. This knife is the highest quality item I have ever purchased from U.C. I could not be more happy with this knife. Monster 1/4" inch thick blade is virtually indestructible.. Grip feels awesome. Sheath has the best options for leg strapping or belt carry of most any knife for this price.. Titanium electroplated blade is absolutely beautiful.. Only issue I agree with the previous review is the finger groove above the grip.. It's NOT a finger groove.. It is sharpened so you can't "choke up" on this one.. I would recommend this knife to anybody who was interested in a heavy duty life time quality knife.. Great job U.C. and thanks BUDK!! BudK delivered on time as always. Great service. United Cutlery could have done much better for the price of this piece. It would have been better in my opinion with a leather version of the M.O.L.L.E sheath. The finger grove for a better grip comes almost sharp, so that is not good for when using it combat style. If a friend offered to buy this one from me, I would sell it to them.